In discussions over economic issues in modern American politics, we often hear about the idea of “shared sacrifice” and how everybody need contribute to solving our budget problem. Both major political parties in our country have agreed that the budget gap must be reduced and the only real disagreement is on how to do so. The Democratic position on fixing the budget gap is a “balanced” approach that combines spending cuts, entitlement “reforms” (read: cuts), and tax increases on the wealthy. The balance of cuts and tax increases varies, but the starting ratio offer of spending cuts to tax increases is $3 in cuts to $1 in tax increases. In reality, this plan favors cuts far more than tax increases and is only considered “balanced” because it is less skewed in favor of the rich then the alternatives. 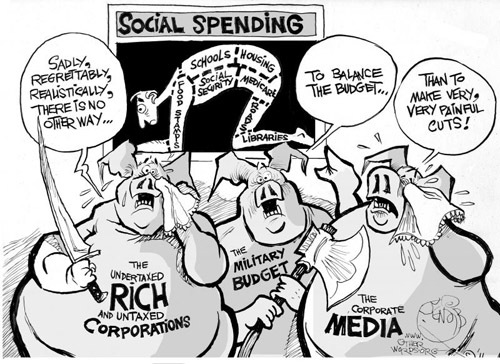 The Republican position of for fixing the budget gap consists of draconian spending cuts in discretionary programs and entitlements and extreme tax cuts for the wealthy/corporations. Such a plan relies upon the debunked theory that tax cuts will stimulate investment and will result in an overall expansion of the economy (trickle-down economics). All of the pain in this plan is directed at the poor—whose benefits are cut—and all of the economic stimulus is directed at making the wealthy more wealthy (under the theory that, if they had just a little more money, they would invest it). As the mainstream political discussion occurs between the positions of the Democrats and the Republicans, few people have recognized a simple truth which exists outside of the mainstream bargaining positions: Wealthy individuals have made tremendous economic gains in recent years while the poor and middle class have been economically crushed. The distribution of economic wellbeing has been skewed so far in favor of the wealthy that there is no reason why the poor should be required to share in the pain of fixing our economic problems. While I often disagree with Mr. Sharpton, his observation about this situation is entirely on point and needs to be pointed out by more mainstream figures. In the discussion over how we should distribute the pain while fixing our country’s economic woes, we have somehow become blind to the massive disparities in the recent economic gains of different groups. Put plainly: Since some groups benefitted from the economic crash, while others were devastated by it, why should both sides be expected to share in the pain that will come from deficit-reduction measures? Over the last several decades, the income disparity in the United States has exploded, leading to a massive disparity between the rich and the poor. The rich have gotten tremendously wealthier while the poor have seen virtually no income growth. Currently, the income disparity in the United States is larger than is has been at any point in modern history and is worse than that of some South American countries. 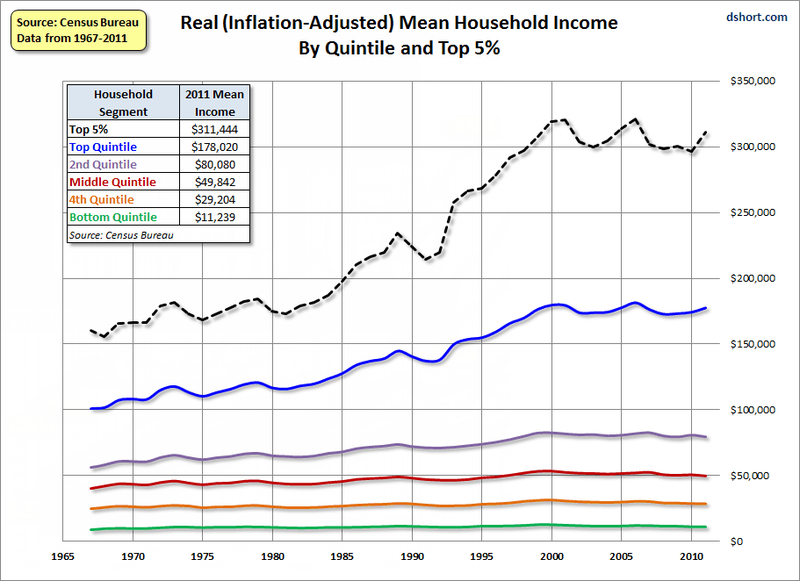 As this graph clearly shows, different income brackets have experienced very different changes in real income—the top income brackets have seen their income steadily increase while the poor have seen no change in their real income. For example: Since 1970, the median income of the top 5% has nearly doubled while the median incomes of the bottom 50% have remained virtually unchanged. Since the incomes of the wealthy have increased so much faster than those of the poor, why is seen as fair for both the rich and the poor to have to pay for the national deficit? The rich are far more able to pay a little extra then the poor and will suffer far fewer negative effects from deficit-reduction measures. Forcing the poor to shoulder cuts in an attempt at deficit reduction will increase the growing income disparity and is tremendously unfair—this isn’t even considering potential high income tax cuts that might accompany program cuts. Given the wage stagnation of the average worker, any significant pain to be directed at them will be disproportionately more damaging to them then to the rich—even if the top 5% were to have their taxes increased by a flat 30%, their income would still have grown proportionally faster than any other demographic group. When determining who should have to pay for fixing the deficit, we shouldn’t only look at who is most able to pay, but also who benefitted most from the things which created the deficit. 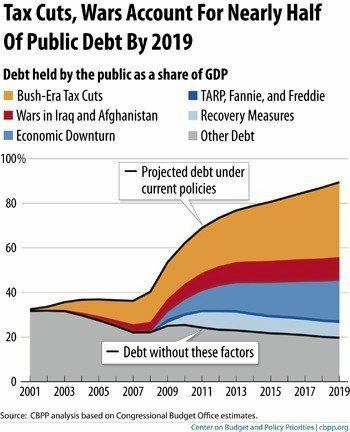 The Bush tax cuts were a major driver of the deficit, so it would stand to reason that the primary beneficiary of the Bush Tax cuts should, of possible, shoulder more of the deficit reduction burden. The Bush Tax cuts were tremendously regressive and gave a disproportionate amount of tax breaks to the already wealthy. The higher the income level, the larger the tax rebate from the Bush Tax cuts was. 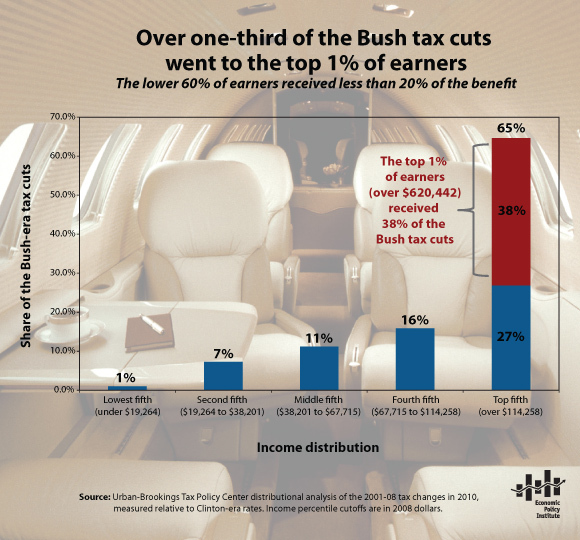 This disparity led the top 1% to take home nearly 40% of the money from the Bush Tax cuts, while leaving the bottom quintile (20%) approximately 1% of the tax breaks. If the top income brackets took home most of the benefits from a major driver of the deficit, then it stands to reason that they should pay most of the costs that come from fixing the deficit. Expecting the poor and middle class to share in the pain for fixing the budget hole created by a program that they received virtually no benefit from is a pure transfer of wealth to the wealthy. To put this into less arcane terms, imagine going to a restaurant with a large group of people, eating dinner, and then having to divide the check. Out of the 20 people to eat dinner, 16 of them account for only 35% of the bill, while the other 4 people ordered lobster and account for 65% of the bill. Despite the huge difference in ordering, the bill is divided equally (shared sacrifice), leading everybody having to pay 5% of the total costs (across the boards cuts). While this division looks fair initially, any further analysis shows just how unfair this situation is: each of the 16 frugal eaters only account for 2% of the bill, yet have to pay 5% while each of the 4 lobster eaters account for 16% of the bill and only have to pay for 5% (less than a third of what they benefitted). Just as in the restaurant example, what is being called “shared sacrifice” by our politicians is actually expecting the poor and middle class to pay for things which only benefited the rich. The rich received most of the benefit from the things which led to the increase in our deficit, thus they should be expected to pay the lion’s share of the costs associated with fixing the problem. In addition to disparities in income and benefits from deficit-driving programs, we need to look at the real costs associated with deficit-reduction measures. Many people wrongly assume that sacrifice is directly correlated with pain, but this is not actually the case; some people are able to sacrifice far more than others before they feel any economic pain. Tax increases on the rich and upper middle class families are far less disruptive then cuts to programs that let the poor and lower middle class eat. The wealthy are simply far more able to sustain the burden of deficit reduction then the poor and will feel less pain, even when they have to sacrifice more. The wealthy have enough disposable income that economic pain directed at them will have no appreciable effect on their quality of life—they may not buy that summer house on Nantucket, but they will have plenty of money to live well. Tax increases on these people may be irritating, but they do not cause significant pain. Poor and middle class Americans lack disposable income and often rely on social programs to pick up the slack. Any cuts to the programs which keep people out of poverty have a very real effect on these peoples’ lives and can mean the difference between being able to eat and skipping meals. Proposing that equal pain is inflicted on the rich and the poor when a rich person defers buying a new sports car and a poor person has to choose between rent and clothing for their children is simply disingenuous. In order to minimize the actual pain inflicted on Americans, it is necessary for the wealthy to shoulder most of the sacrifice. In order for our deficit reduction attempts to be truly fair, we must look outside of the mainstream political discussion. Just because one side says that sacrifice must be shared while the other supports only harming the poor and middle class, it doesn’t mean that the truly fair choice is somewhere in the middle. In this situation, both major political parties are wrong and are proposing deficit reduction plans that disproportionately harm the poor. Suggestions that everybody needs to “share the sacrifice” in reducing the deficit may sound fair on the surface, but are horribly unfair when one considers other factors. The wealthy in our society are not only more able to pay the costs associated with deficit reduction, but have received more of a benefit from the things that created the deficit in the first place. The poor and middle class are currently being crushed by wage stagnation and joblessness, making any attempt at balancing the budget on their backs completely unfair. For truly fair deficit reduction, we must go in a more progressive direction and expect those who have reaped the benefits of our society to pay back into supporting the system. Reject the need to compromise between the positions of the two dominant parties and support a truly fair deficit reduction plan. You should start a petition to this effect on whitehouse.gov.